The UK national debt is the total amount of money the British government owes to the private sector and other purchasers of UK gilts. This is the amount the government has to borrow per year. Deficit down but debt up? One potential confusion is that politicians may say the budget deficit is coming down. But, at the same time, national debt is rising. 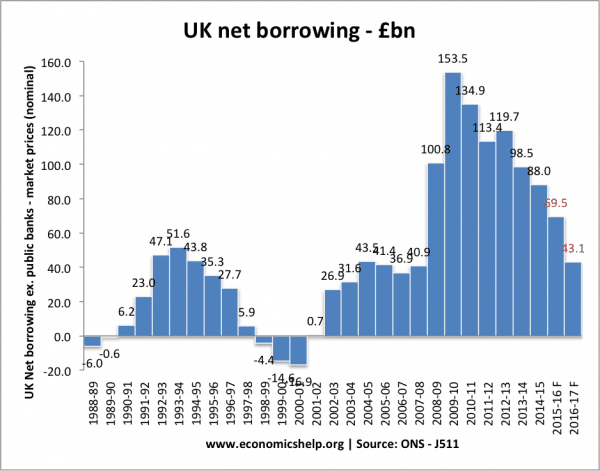 If annual borrowing falls from £80bn to £50bn, the annual deficit is lower. But, at the same time, the national debt (total debt) can still be rising. The most useful measure of national debt is to look at debt as a % of GDP. 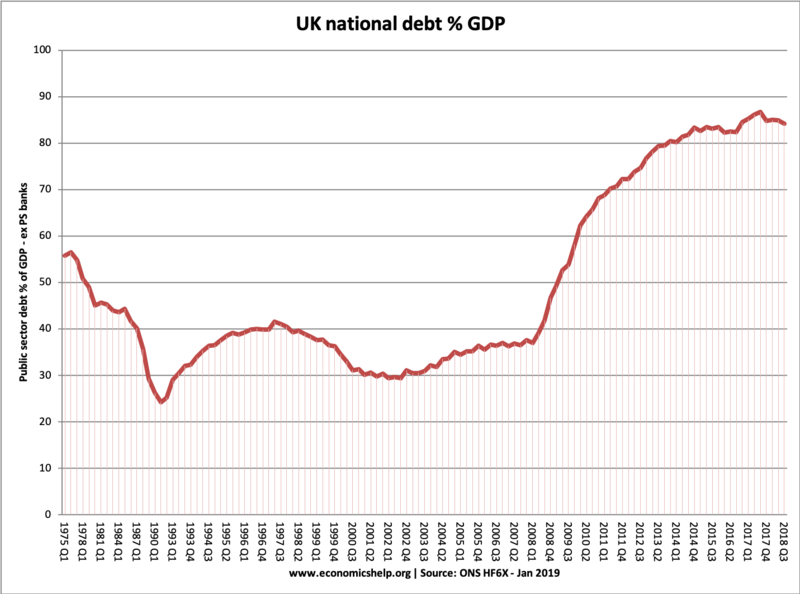 For example in 1950, UK national debt was £640bn (at 2005 prices) – but this was 250% of GDP. 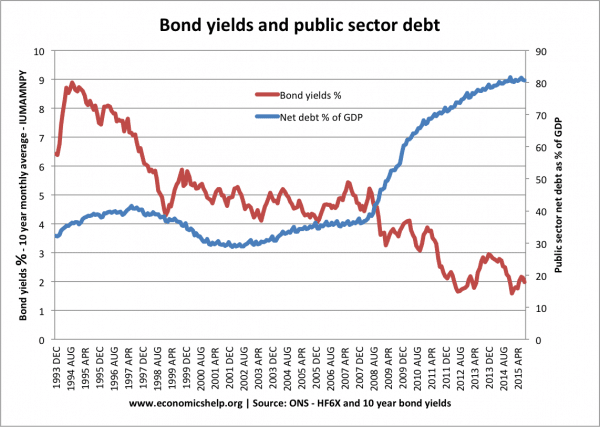 After a period of financial restraint, from mid 1990s, public sector debt as a % of GDP fell to 29% of GDP by 2002. From 2002 – 2007, national debt increased to 37% of GDP. This increase in debt levels occurred despite the long period of economic expansion; it was primarily due to the government’s decision to increase spending on health and education (see: Government spending in this period). There has also been a marked rise in social security spending. 2008-13 recession (lower tax receipts, higher spending on unemployment benefits) The recession particularly hit stamp duty (falling house prices) income tax and lower corporation tax. Financial bailout of Northern Rock, RBS, Lloyds and other banks. From 2011-2015, the pace of increase in the public sector debt has slowed due to the government attempts to reduce the budget deficit. The government has announced strict spending limits. Although 80% of GDP is high by recent UK standards, it is worth bearing in mind that other countries have a much bigger problem. Japan, for example, has a National debt of 225%, Italy is over 120%. The US national debt is close to 80% of GDP. [See other countries debt]. 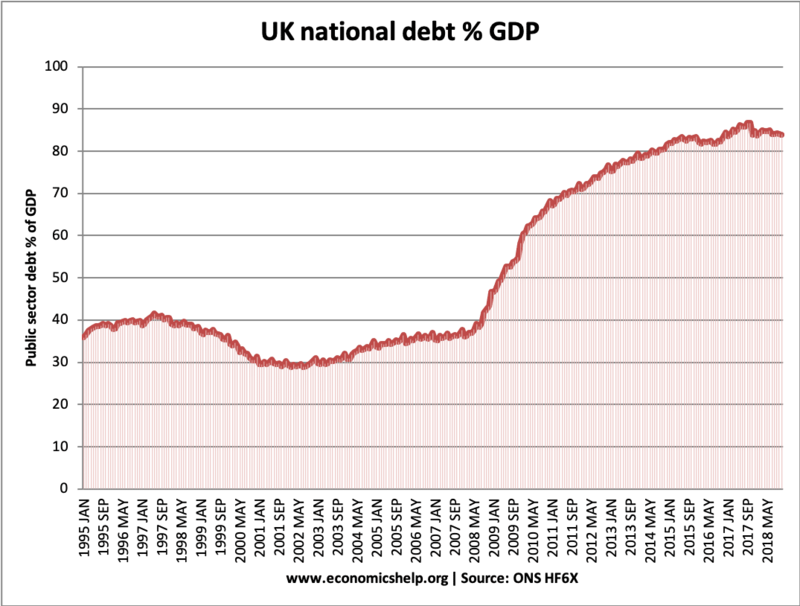 Also, the UK has had much higher national debt in the past, e.g. in the late 1940s, UK debt was over 200% of GDP. 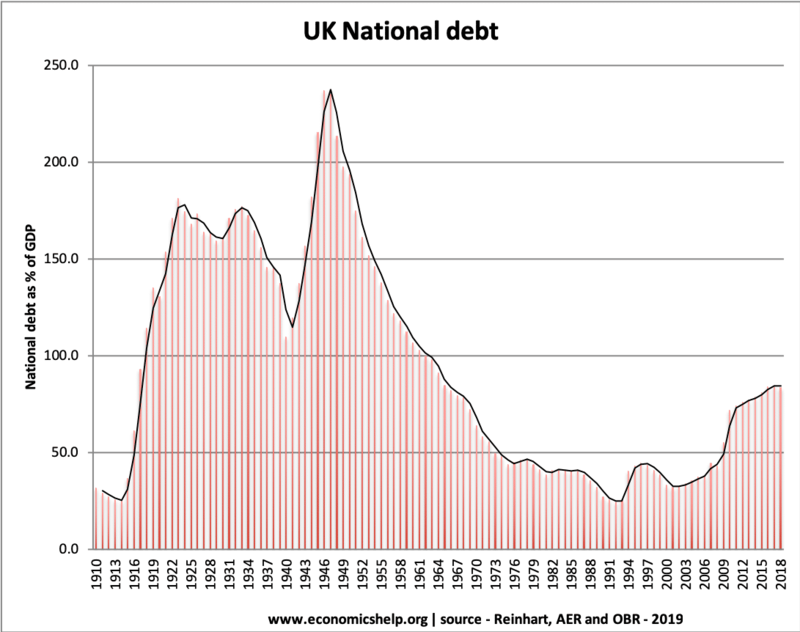 UK National Debt since 1900. Source: Reinhart, Camen M. and Kenneth S. Rogoff, “From Financial Crash to Debt Crisis,” NBER Working Paper 15795, March 2010. and OBR from 2010. These graphs show that government debt as a % of GDP has been much higher in the past. Notably in the aftermath of the two world wars. This suggests that current UK debt is manageable compared to the early 1950s. (note, even with a national debt of 200% of GDP in the 1950s, UK avoided default and even managed to set up the welfare state and NHS. 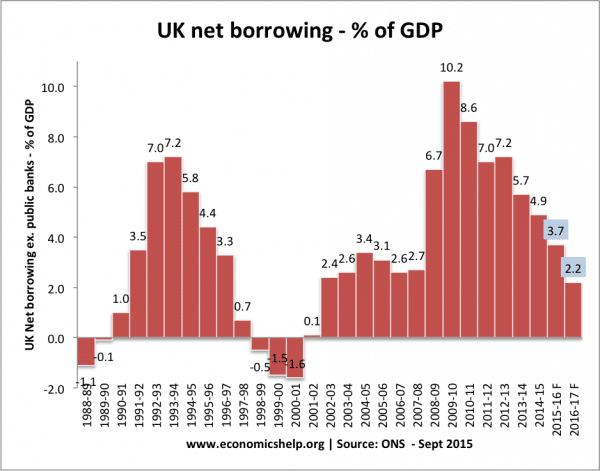 In the current climate, the UK would struggle to borrow the same as in the past. For example, private sector saving is lower, and the US wouldn’t give us big loan like in the 1950s. The post-war levels of national debt suggest that high debt levels are not incompatible with rising living standards and high economic growth. The reduction in debt as a % of GDP 1950-1980 was primarily due to a prolonged period of economic growth. This contrasts with the experience of the UK in the 1920s, when in the post First World War, the UK adopted austerity policies (and high exchange rate) but failed to reduce debt to GDP. Debt in Post-First World War period. How much can a government borrow? Bond yields reflect the cost of borrowing. Lower bond yields reduce the cost of government borrowing. Since 2007, UK bond yields have fallen. Countries in the Eurozone with similar debt levels have seen a sharp rise in bond yields putting greater pressure on their government to cut spending quickly. However, being outside the Euro with an independent Central Bank (willing to act as lender of last resort to the government) means markets don’t fear a liquidity crisis in the UK; Euro members who don’t have a Central Bank willing to buy bonds during a liquidity crisis have been more at risk to rising bond yields and fears over government debt. 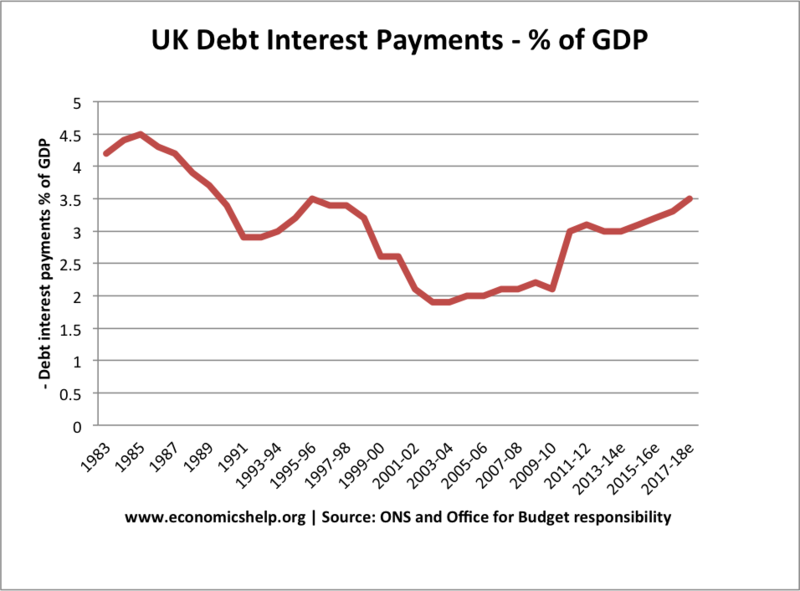 As a % of GDP, debt interest payments are relatively low. How to reduce the debt to GDP ratio? Economic expansion which improves tax revenues and reduces spending on benefits like Job Seekers Allowance. The economic slowdown which has occurred since 2010 has pushed the UK into a period of slow economic growth – especially if we consider GDP per capita growth. Therefore the further squeeze on tax revenues has led to deficit reduction targets being missed. Government spending cuts and tax increases (e.g. VAT) which improve public finances and deal with the structural deficit. The difficulty is the extent to which these spending cuts could reduce economic growth and hamper attempts to improve tax revenues. Some economists feel the timing of deficit consolidation is very important, and growth should come before fiscal consolidation. What will be the impact of Chancellor’s plan to run budget surpluses? Is it a good idea to enshrine in law the idea of a government being forced to run a budget surplus? What is the real level of UK national debt? It is argued by some that the UK’s national debt is actually a lot higher. This is because national debt should include pension contributions and private finance initiatives PFI which the government are obliged to pay. The Centre for Policy Studies (at end of 2008) argues that the real national debt is actually £1,340 billion, which is 103.5 percent of GDP. This figure includes all the public sector pension liabilities such as pensions, and private finance initiative contracts e.t.c (and Northern Rock liabilities). However, it is a sign that it will be difficult to improve finances in the future. Another problem is that with the financial crisis, the government have added an extra £500bn of potential liabilities. Note: the Government has offered to back mortgage securities. They are unlikely to spend this money. But, in theory, the government could be liable for extra debts of up to £500bn. If we include this bailout package as a contingent liability National debt would be well over 100% of GDP. However, with a modest improvement in the bank sector, the necessity for these bailouts look unlikely, unless there is a very sharp deterioration in global financial markets – which is always possible. What are the prospects for UK debt default? Interest payments. The cost of paying interest on the government’s debt is very high. 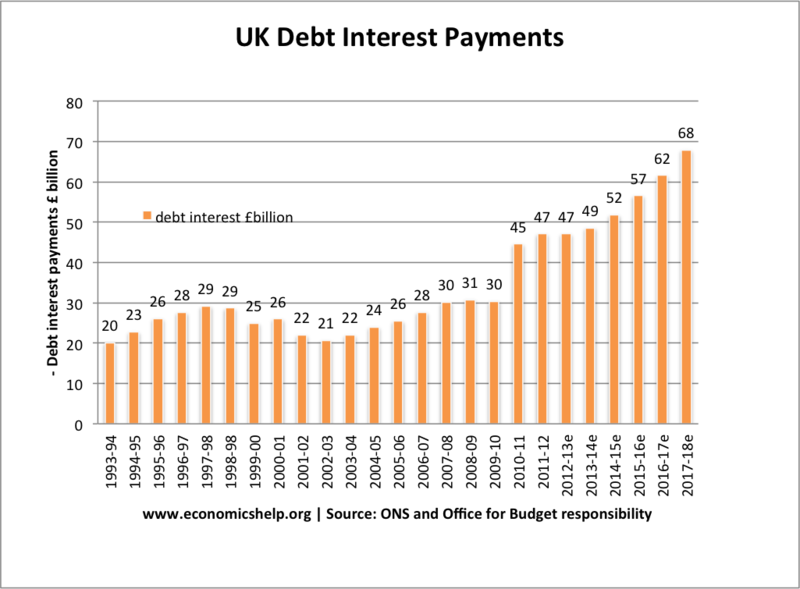 In 2011 debt interest payments will be £48 billion a year (est 3% of GDP). Public sector debt interest payments will be the 4th highest department after social security, health and education. Debt interest payments could rise close to £70bn given the forecast rise in national debt. Higher taxes / lower spending in the future. Crowding out of private sector investment/spending. Potential of rising interest rates as markets become more reluctant to lend to the UK government. However, Government Borrowing is not always as bad as people fear. 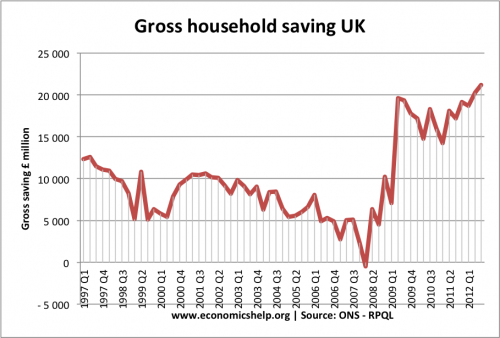 Borrowing in a recession helps to offset a rise in private sector saving. Government borrowing helps maintain aggregate demand and prevents a fall in spending. In a liquidity trap and zero interest rates, governments can often borrow at very low rates for a long time (e.g. Japan and the UK) This is because people want to save and buy government bonds. The majority of UK debt used to be held by the UK private sector, in particular, UK insurance and pension funds. 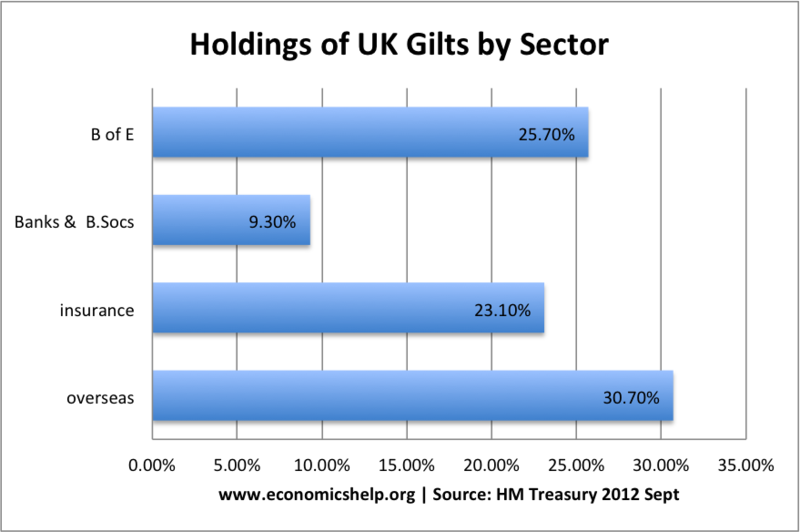 In recent years, the Bank of England has bought gilts taking its holding to 25% of UK public sector debt. Overseas investors own about 25% of UK gilts (2016). See more at: Who does the UK own money to? More at: who owns UK debt? 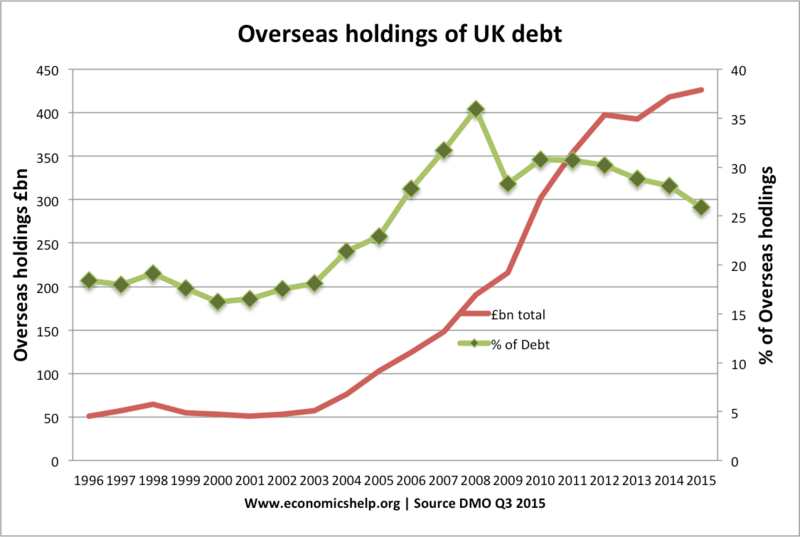 Another way to examine UK debt is to look at both government debt and private debt combined. Should we worry about National Debt? The biggest lie in UK politics? – Is the debt issue exaggerated? 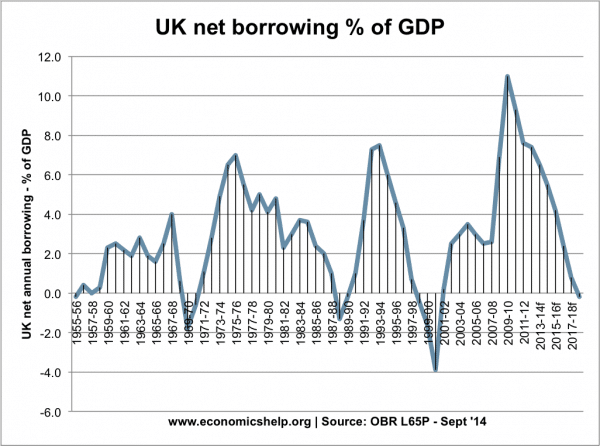 Should the pace of the UK’s deficit reduction be slower? How is National Debt financed? This entry was posted in uk economy and tagged uk debt, uk economy. Bookmark the permalink. The U.K. is in big trouble, much more than in 1945, 1918, 1815 and 1713, when a lot of soldiers came home and became economically productive again. Debt was financed in the old days by Washington and earlier Amsterdam, but they will be unable to finance the U.K. government debt in the future. From 2006 to 2016 the Bank of England bought a third of all the U.K. government debt. It is now financed by the money in circulation, by people with banknotes in the bank and their pockets. The Bank of England has a weak position since 2006. The U.K. and the other countries with FPTP voting system (U.S. Canada, France Italy and perhaps Australia) could go bankrupt in the next generation and stop paying intrest, which would mean the end of the welfare state. The figures for 2017 are still unknown, but the government debt percentage in countries like Germany, Sweden, Denmark and Netherlands, which have proportional representation, could go down with 3 to 5 percent, while it could go up or remain as it is this economically good year in countries with FPTP voting system, just as it did in previous years. For the U.K. the future is exceptionally bleak because of its very low savings rate, down to 11% in 2016 according to the World Bank. Then there is Japan. It has the lowest intrest rates in the world, lower than tax haven Switzerland. Its debt is financed by its own savers. This 250% debt could mean frictions in the future, but by that time the U.K. is long finished. What do you mean by financed by Washington and Amsterdam? Do you mean that they actually lost money on the loans? It’s a popular myth that government debt is a bad thing. It’s a fact that the UK government does not need to issue debt. In the modern era of money the Bank of England can create any amount of money that the government requires without having to borrow or tax a penny of the sum in question. That is because all money is now, as a matter of fact, created out of thin air when banks lend money, including when the Bank of England lends directly to the Treasury. This is because all money is debt: if in doubt read what it says on a UK bank note, and realise that these are just debt, a fact that is confirmed by this cash being included in the national debt in the UK’s government accounts. 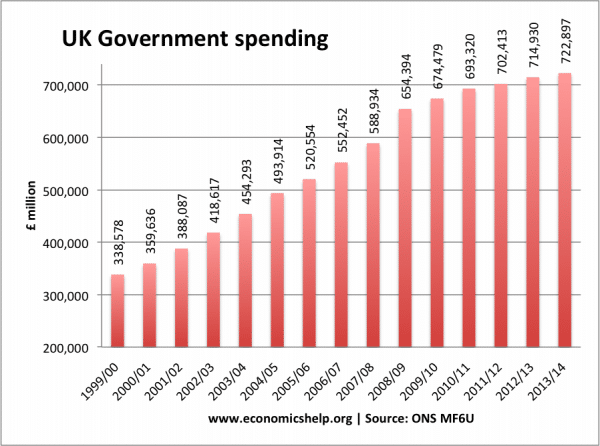 Quantitative easing also proved this: £435 billion of UK national debt has been monetised since 2009. There is then no technical reason why all government debt could not be cancelled (as this QE debt has, in effect, been) in this way. As a result it has to be appreciated that when the UK has its own currency and its own central bank government debt is a choice and not something that has to be issued. Another obvious fact: government debt is just another form of government created money. It’s convertible into cash, as QE proves. And all it provides is a savings mechanism. But it is a very important savings mechanism. In fact it’s the most secure for of saving available in the UK. That is because whatever happens the UK government will always be able to repay its debts because it can always, on demand, electronically create the cash to do so. It has that right. No one else has it in the same way. And creating that money is effectively costless: it happens simply by entering data into a computer. Having made these obviously correct points (which appear to have passed most people by) let me now say why we need steady growth in government debt. First, if we are to have some inflation (and we generally agree two to three per cent is good) then we need more money. And government debt is money. It is, in effect, the promise to pay that underpins the economy. So inflation says we need more of that debt each year. If we don’t get it then the economy is starved of cash and that causes economic stress, at the very least. It might also lead to more private debt, and that is much more dangerous as it carries much higher interest costs than government debt and so constrains real growth. So inflation demands more government debt. It’s the best deal for a growing economy that there is. That’s why governments have to create it. Pensioners also demand more of that debt. The annuities that underpin all private pension payouts involve a delicate juggling act that balances life expectancy against the funds available and the return that they can generate. One variable where the risk can be reduced is the rate of return and the certainty that it will be paid. The return on government debt may be very low (it’s effectively negative at present after inflation is allowed for) but it is guaranteed to be paid, and that is exactly what pensioners want. No one wants their pension to expire before they do. So, government debt is what pension annuities are very largely invested in. And as we face an increase in private pensioners as the baby boom generation retires the need for government debt to underpin their pensions is growing. Third, banks need this debt. When most people put money in the bank they assume it is safe. That is because the government guarantees the deposits most individuals make in banks so that if the bank fails the depositor will get their money back. That is the only reason most of us trust a bank. But this does not apply to businesses depositing millions of pounds in their bank accounts overnight, as happens every night in the UK. Those businesses have no such guarantee. If the bank fails on them, as Lehman did in 2008, then they might well go down with it. So they don’t deposit the cash. They enter into contracts with banks. The banks sell them government bonds in the evening, which the depositor then own, and which cannot fail because the UK government (unlike banks) can’t fail, and which the bank agrees to buy back in the morning at a slightly higher price, with the increase representing the interest due. If there were no government bonds to fulfil this role then the banking market would grind to a halt. Fourth, at times like the present when the real rate of interest (as adjusted for inflation) is negative those who own government debt subsidise the taxpayer. The more debt there is the more the taxpayer is subsidised. Fifth, interest paid on government debt is a good thing. As already noted, it underpins private pensions for a start. And a lot of the most stable savings funds. I’m not saying this is a perfectly equitable redistribution of wealth, because it is not. But I am also saying it is not income lost to the economy. And because it’s taxable some is even recovered. But saying it’s terrible is akin to an argument against usury and is again akin to an argument that a government should not have a role in seeking to provide a secure, stable and safe banking, pensions and savings sector in the country. I would argue that is precisely one of the roles government should have. So we need debt, and because of inflation, growth and growing numbers of pensioners we need more of it. How much more? Notional UK national debt is now about £1.8 trillion and after QE it is around £1.4 trillion. Assume inflation of between 2% and 3% and how much extra debt do we need a year? Anything between £30 billion and something in excess of £50 billion would seem to be the answer. It’s not a precise science: there will be swings and roundabouts. But the point is that this new debt is vital: it has to happen or the economy is harmed. And this sum excludes debt issued for specific purposes, like an infrastructure fund. Issue less than this and the economy will be in trouble. That’s a simple fact and explains why obsession with a balanced budget is so dangerous. The final fallacy is that one day the debt will have to be repaid. No it won’t. That’s because this debt is money. That makes it unlike all other debt which is denominated in money. They’re simply not the same thing. Debt denominated in money has to be repaid. Debt that is money is only repaid if we want to destroy money. And why would we want to do that? Is anyone seriously suggesting that we can live in a moneyless society in future? I seriously doubt it. And in that case national debt does not have to be repaid, ever, which is exactly what history tells us. Government debt is a good thing. The danger is inherent in the myth that it isn’t. Bank bailout was £500bn and has largely been repaid, although the public purse has taken a loss of £27Bn which is small beer when you look at the numbers. Most of this is increased borrowing as a result of recession/economic downturn, not austerity. Austerity was used as a means to try and reduce the ongoing deficit, so that we didn’t borrow more. No, the national debt was 1.83 trillion in December and still rising.